What a thrilling vocal on Im Leavin. Truly amazing track. More Life and I Want You are cracking too. as ever with Jonny L, originality is the order of the day. I forgot to mention this is a serious amen work out! Real roller but ruff as fook! 'I Want You' is epic with fierce Amen chops, house tones, classy vocals and serious rhythm. The bassline is heavy as well. Serious track. 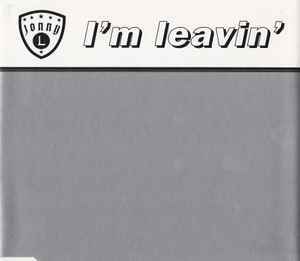 'I'm Leavin' is another epic dance floor bomb with wicked summer vibes and rolling breaks. As stated earlier this is Jonny L at his epic fun best. That star I removed is solely because they used the radio edit of the title track. Why did they have to do that? The vinyl got the full version, so why'd they choose to butcher it for the CD? The original track is fantastic, atmospheric, beautiful, catchy as hell... the radio edit, as usual, just cuts out all the best parts, gets rid of the flow and personality... ugh. Radio edits seriously just need to die. ...But, if you rip the CD to the computer, throw the first track in the recycle bin, then swap it out with a CD-rip of the full version from XL Recordings: The Fifth Chapter - The Heavyweight Selection, you have yourself a nice set of 4 perfect tracks. All of them are emotional, intricate, and just generally great. Coming off his rave singles I wasn't expecting to like this very much (I'm not big on DnB), but I was left thoroughly impressed. Definitely recommend. high quality production from Jonny L on this and the drumwork really stands out. essential. What can I say about this release here apart from all tracks featured are absolutely essential for anyone who loves hard edged jungle/drum & bass. Sounding well ahead of it's time compared to other tracks released around 1995. 'I'm Leavin' is a storming amen-fest of a tune with powerful, emotive vocals from Dee and soaring synths. An extremely intelligently produced track which never let's up on the dancefloor either. 'More Life (Edit)' heads to more darker territory with sinister, distorted robotic vocal samples stating 'I want more life' combined with heavy breaks. Before you can say that's your fill of outstanding tracks on one EP, the final track comes in to floor you into submission. I first heard 'I Want You' on an old Ray Keith mixtape back in 1995 and had spent about 13 years trying to I.D. it. Starting off with twisting bass throbs and simplistic breaks, it then confuses you by introducing a familiar house music, keyboard section. Then blasts you with heavy-as-hell pitched down and chopped-up amens, and a stuttering female vocal. 'I Want You' contains equal doses of smoothness and rough qualities which makes it perfect listening for the body and the soul. One of the best EPs in the genre. From the haunting and catchy vocal tunes to the tearin' and dystopic bladerunner sampling "more life", the production quality and execution is infallible. "I want you" is one of the first tracks to use a pitched-down amen and it has wonderful instrumentation (in golden era of house sort of way). "I'm leavin'" would still make a great last tune of the night despite the lyrics-so very touching! Sam has the most intricate apache work i've ever heard on wax with really nice lush synths and a wonderful vocoded vocal bit. This is an example of self-realized dnb at its' finest.